Wealthy Walter Frazer, a man who once blamed his daughter-in-law Sue Ellen for his son�s failures, has a change of heart when she is charged with the son�s murder. Perry proves to Frazer that Sue Ellen was nothing less than a loyal wife and his son was a weak-willed gold-digger. Fans will recognize Alan Hale of Gilligan�s Island in a devious role and DeForest Kelley from Star Trek as the hen-pecked husband of a rich woman. Sightings: The Little Old Lady in a Hat appears sitting behind Lon Snyder (Alan Hale) when Mason is questioning Medeci (Gerald Mohr) at the hearing. So does �Sasha Magaloff�. [See also Continuity item, below.] Blue Collar Guy is the bartender at Medeci�s night club. More about these people on the Who Is That? page. Submitted by Kenmore 9/15/10. Updated by alan_sings, 9/26/10. + Additionally, Distinguished Lady #1, sporting a an updated shorter hairdo, is sitting in the back row (prosecutor�s side) next to a hairline that looks like it might belong to Distinguished Gentleman #1. (Near the end, we see that it does). And Pencil Mustache Man is right next to the pianist Cary Duncan. Submitted by gracep, 12/10/2010. Continuity: As regards to the Little Old Lady sighting above, we can see her the courtroom from the beginning, when Burger questions Tragg, but she teleports magically from one side of the courtroom to the other. Submitted by gracep, 12/10/2010. 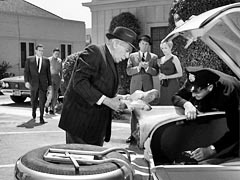 Uncredited Actors: Don Anderson appears as a plainclothes policeman holding a notebook standing next to Diana Millay as Lt. Tragg searches the trunk of her car. Tragg gives him the order to take her downtown. Submitted by FredK, 3 Nov 2010. + Lee Miller as Sgt. Brice interviews (inaudibly) Lon Snyder at the Club Baroque. Submitted by gracenote, 12/10/2010. Diana Millay and Alan Hale must have had some unsuspected chemistry in the opinion of the Mason production staff. They later appeared together in Episode #192 TCOT Bouncing Boomerang. Submitted by FredK, 3 Nov 2010. Character Names: The Thorpes address the patrolman as Joe. Sue Ellen�s last name is of course Frazer as she is Gregson�s Unwelcome Bride, and Medici�s first name is Joe. To have omitted these latter two is strange when others had their full names. Submitted by gracep, 12/10/2010. + Although there seems to enough room to add "Joe" to Medici's credit there wasn't enough room to add "Frazer" to Sue Ellen's name without making it a two-line credit (where there was already one with DeForest Kelley's credit); not enough room on the credit page for another one. Since there was already a "Joe" in the episode (Medici) simply saying "Joe" without the "Patrolman" would have been confusing. This may also be why the Joe was omitted from the Medici credit. Remember, the presence of a credit (and how many on each "page") is due to legal reasons but the form of the credit itself is for the quick information to give the viewer in a limited time. Submitted by Wiseguy70005, 12/22/14. ++ Not to insult Wiseguy70005, but Joe's last name is "Medeci", not "Medici". According to Wikipedia (because I wondered if the writers intended the allegory) "The House of Medici was an Italian banking family and political dynasty that first began to gather prominence under Cosimo de' Medici in the Republic of Florence during the first half of the 15th century." jfh 26Oct2018. Location: Since the show likes locations to pull Double Duty, I suspect the Tudor house 3 minutes into this episode (probably in Hancock Park) is also the Tudor 3 minutes into �TCOT Injured Innocent.� Submitted by Eric Cooper, 26 May 2011. Location Anomaly: About 25 minutes in, Paul drops Perry off at Peter and Amanda�s house in a quiet neighborhood. Tragg is out in the backyard of the house with his head in a car�s trunk. See photo above by title. In actuality I believe he�s back at the studio. Why? (1) Most homes don�t go to the trouble of having parking spot stripes painted in their backyard. (2) You can see a very large building not house next door. (3) I've seen the studio and the stucco building directly behind Tragg looks similar. Why did they do it? Remember the old joke... What I�m looking for is really over there� but the light is better here. Submitted by Eric Cooper, 26 May 2011. Walter Frazer gives Perry Mason a call, and when the attorney answers, next to his phone is a cup and saucer from the Curious Coffee Set. Della has the same by her seat at his desk. Submitted by gracenote, 7/13/2011. + TT was born in Bombay, India to British parents & studied at the Royal Academy of Dramatic Art before serving as a Royal Artillery Colonel during WW2 [IMDb]. Mike Bedard 7.8.16. CARS. Who drives which car where and when is a subject of Perry's courtroom presentation. (1) 1961 Buick LeSabre Convertible, medium color, top down, Lic No VBV 994, Amanda & Peter Thorpe, referred to as "PETER'S CAR". The pod above the center of the dash houses a clock, optional on LeSabre but standard on Invicta, Electra & Electra 225. (2) 1962 Ford Galaxie Mainliner 4-Door Sedan, medium color, Lic No WDN 939 with roof-mounted antenna, driver's spotlight and "SECURITY PATROL" with star on driver's door. Driver is Patrolman "Joe" of the "Special Police", badge 15. This is the First 1962 Model-Year Ford to appear in the series. The '62 Galaxie Mainliner was the most austerely equipped full-sized Ford and was meant for fleet service, including taxis & police (2-Door shown here). (3) 1957 Ford Fairlane 500 Sunliner, Sue Ellen & Greg Frazer, Lic No NPG 373, soft-top down, 2-tone light colors, with Continental Kit (rear bumper-mounted spare). Referred to as "GREG'S CAR". Tragg finds sneakers in the trunk - see photo above, Car (1) in background. (4) 1961 Lincoln Continental, light color, parked in Walter Frazer's driveway. There were only two models: Sedan and Convertible, both 4-Door. It could be either: Lincoln's immaculate convertible top made it hard to tell the difference. Referred to in testimony as "Mr FRAZER'S CAR". (5) Paul 's black 1961 Thunderbird Convertible, top down, Lic No VNE 547. (6) 1961 Ford Fairlane 4-Door Sedan POLICE B&W, parked in driveway at murder scene (the Thorpe house) with roof-cherry flashing. Plymouth/Chrysler upstaged Ford in Product Placement by getting one of its 1962 Plymouth Savoys into the immediately preceding episode #136. Added by Gary Woloski, 2/16/13. There are a few instances in the courtroom where Perry's dialogue is dubbed over the action. Sometimes his lips don't exactly match (while walking towards the witness stand and Mr. Snyder and again while walking over to the judge) and others the audio abruptly cuts off between words (during the second cross-examination of Medici). Submitted by Wiseguy70005, 12/22/14. At the end of Medici's first cross-examination the bottom slot of Mason's visual aid had not been revealed. At the start of the next courtroom scene it had been revealed. Since Mason only reveals the slots during points of his cross-examination, does this mean we missed some part of a cross-examination? Submitted by Wiseguy70005, 12/22/14. He's dead Jim (Or more logically "He's dead Perry"): if you're tuning-in in hopes of hearing that immortal line, then don't bother: DeForest Kelly doesn't discover the body. Submitted by Notcom, 010516. Torin Thatcher and DeForest Kelley would be reunited on the Star Trek episode "The Return of the Archons" broadcast 2/9/67. Submitted by Wiseguy70005, 6/11/12. This episode (production #138) was held over for some reason for almost three months. The first actual fifth season episode shown this season (September 30) was episode #139 so this episode could have been broadcast then. Instead most of the episodes in the production range of the 140s were shown before this one was broadcast on December 16. Submitted by Wiseguy70005, 12/22/14. + That explains a lot, Wiseguy70005! First, Della is fully present and has lines, unlike in later episodes, where she is silenced or absent; second, George E. Stone is still with us in the courtroom; and third, the quality of the plot and dialogue is excellent. No wonder I thought, "Hey, they got back to their old quality here!" Sadly, no...this is a legacy episode from before things declined a bit. Not that the show was ever bad, but the first 4 seasons are the gold standard, in my opinion. Submitted by JazzBaby, 3/5/2019. Why is there a sign advertising Sue Ellen's appearance at Medeci's club when she supposedly stopped working there when she married? Seems unlikely someone rifling the safe wouldn't check the contents of that envelope. In keeping with the tradition of alliterative titles, this could have been "Banished Bride"